With Cannabis now being legal here in Canada, we are bombarded with information about consumption, health matters and of course, legal and social issues. In this article, we are only considering the affects to our electrical grid and ultimately your power bill if you are a grower. There is no doubt this industry will have a profound effect on our environment and power grid. The need for energy efficiency and renewable energy production at grow ops, be they home grow ops or massive multi-Megawatt commercial grow ops is a given. Some of the earliest adopters of solar where Cannabis farmers. 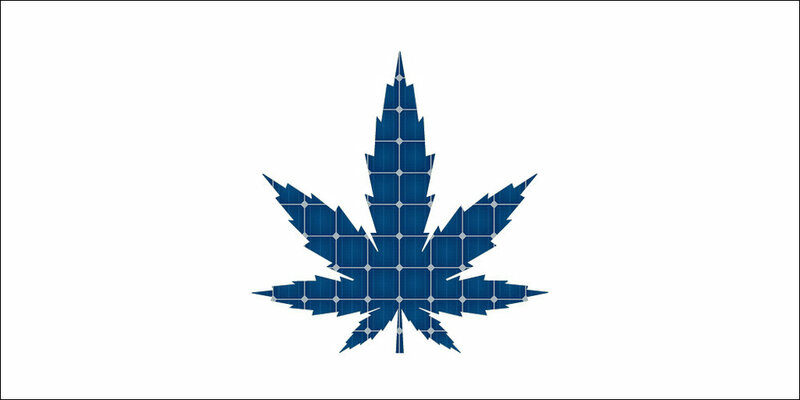 According to Robin Gudgel, a pioneer in the solar industry, marijuana growers in northern California gave them the first leg up in the 1990’s. Off-grid solar systems are perfect for generating energy in remote locations without much noise or need to transport energy to the site. The good news spread and soon after the off-grid movement was spurred in the US. How much energy will this industry consume? According to Even Mills Ph.D a climate change scientist, the electrical energy that goes into growing a single joint creates 10lbs of CO2, this is equivalent to a driving a Prius 35km. Multiply this by many, many, many joints and you can clearly see the issue. Growing Cannabis is one of the most energy intensive farming operation on the planet, energy use at a commercial grow facility is very comparable to a data center of the same size. In 2012 the Lawrence Berkley national laboratory had pegged legal indoor Cannabis operations consuming 1% of U.S. energy usage. California, being the 5th largest economy in the world, has 3% of electrical consumption going toward growing Cannabis. Clearly these numbers will only rise. In Canada we will likely see a huge number or people growing pot in their homes and Commercial operations are in full swing to try and meet demand. CTV news has reported demand for marijuana in the first year of legal pot will exceed supply by 400 times. Guaranteeing power consumption will only rise as the industry grows to meet this market. It is estimated that Canadians will consume 926,000 kilograms of pot for both recreational and medical use in the first year alone. That’s a lot of electricity use creating emissions and certainly added cost to the grower. When a home-owner decides they want to grow their own craft Cannabis they may be in for a surprise when their energy bill arrives. It’s not simply a matter of buying some lights and soil and you will have free pot for years to come. Studies by San Diego Gas and Electric report that lights account for 38% of energy consumption, venting is 30% and conditioning accounts for 21%. A 4 plant grow operation will consume about 1059.8kWh per grow cycle just for the lighting alone. In a home grow-op it will cost about $106 in energy cost per grow cycle at today’s energy prices. This is roughly $30 extra per month or $360 a year at current electricity rates. A 4 plant grow system in your home would be enough consumed power to justify installing a 4kW solar system under the current micro-generation incentives to off-set 100% of your new garden’s yearly energy consumption. This not only protects your garden from future energy prices but this will reduce those CO2 emissions to zero. When we look to the commercial level production there is greater need for more systems to deal with heat, humidity and air flow. These operations can pose new problems for our utility when wall-mart sized growing facility’s needing multi-megawatt services start popping up, especially if they are not taking efficiency seriously. 1 lbs or .45kg of cannabis needs about 2000kWh of electricity to produce a crop. In comparison, aluminum only needs about 7kWh of electricity per .45kg of product. When we step back and look at the bigger picture, and think 926,000kg of cannabis in the first year, we are looking at 4.15TWh of electricity. Canada consumes 648TWh in a year and this new industry will consume .64% of our total generation of electricity. For contrast the entire agriculture industry used 2% of the total energy in Canada in 2015. The total energy consumption of this new industry will require a similar amount of energy as the Site-C hydro dam in BC’s expected production. There are a lot of unknowns about pot but we do know that the energy consumption will be huge and the trends for energy cost are going up. If you are a facility owner, Farmer or personal grower and are interested in adopting green technology for your green operation touch base with Sunfind and we will help you be a trail blazer for deep green products.